ConservativeHome's ToryDiary: Tebbit attacks Cameron for trying to "purge the memory of Thatcherism"
Tebbit attacks Cameron for trying to "purge the memory of Thatcherism"
It may be David Cameron's big speech day but Norman Tebbit is determined to grab a bit of attention for himself. In a speech to the Bow Group the former Tory Chairman and self-appointed keeper of the Thatcherite flame will "compare the Tory leader to the communist dictator Pol Pot over the way in which he has tried to "purge the memory of Thatcherism"" (Telegraph). This is the second time this month that Lord Tebbit - who backed David Davis for the Tory leadership - has questioned the new leader's strategy. Lord Tebbit told today's Telegraph that UK elections "are won by the party that gets its own traditional supporters out and discourages those of the other parties from doing the same". 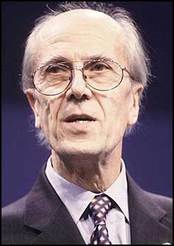 Lord Tebbit clearly believes that Mr Cameron's eschewal of tax cuts and refusal to talk about Europe, crime or immigration will demotivate the party's core supporters. "Is he really 'New Labour Lite', a Tory wolf in Lib Dem sheep's clothing, or a Lib Dem sheep leading a pack of Tory wolves? Or is he the partys Chairman Mao or Pol Pot intent on purging even the memory of Thatcherism before building a New Modern Compassionate Green Globally Aware Party somewhere on the Left side of the middle ground?" Mr Cameron also comes under fire from the party's Europhile wing. Edward McMillan-Scott, former leader of the Tories' MEPs, has told The Scotsman that "Mr Cameron seems to be working towards the centre at home and yet moving to the extreme right abroad as fast as he can." William Hague will be visiting Brussels today as he seeks to implement his leader's decision to leave the EPP. The decision may be controversial amongst the party's Old Europeans but it won the agreement of 76% of party members in last week's survey of the ConservativeHome Members' Panel. uh...tebbit cant he think of something more useful to do...like go bowling or play bingo? If my next post on "Fat people produces fat government" is fat-ist, PM, your comment is certainly age-ist! Pol Pot??!! This is ridiculous. Only if you ignore the comparison, which isn't to mass murder, but rather to destroying the memory of what went before and purging the system. Pretty much any Cameron speech does the former, and the purge of the candidates' list is an example of the latter. Thatcher didn't say a lot on immigration or Europe while she signed away our sovereignty...not as I remember. Tax cuts she did and crime - but she had a grateful Rupert Murdoch behind her after Biffen gave him the Times and Sunday Times - (even though the Sunday Times should have been outside the rules). Cameron is facing down a hostile media that will cheerfully misrepresent any policies as specified by Norm Tebb. I'm not sure that Thatcher provided fodder for her political enemies - and she maintained a judicious silence on immigration and Europe - Tebb's using selective memory. As I said in an earlier post, it is clear to see that the party is increasingly dividing between modernizers and puritanicals. It is a scenario played out repeatedly on this site. This week will see both Cameron and Tebbit deliver two very different speeches representing two very different views on the party. One area the puritanicals should be pleased with is Europe. We look as though we have the most Eurosceptic leader in a generation. "Thatcher didnt sign up to Europe, Heath did. Lets not forget she got the rebate in 1984..."
It was Thatcher's government that signed up to the Single European Act. ... It was Thatcher's government that signed up to the Single European Act. Which was supposed to return power to the nation states under the doctrine of subsidiarity. By far the most ham-fisted spin attempt I have seen in a long time. Perhaps you could be really subtle and call them "poopy-heads"? Look, any showdown between "modernisers" and whatever you want to call the other 85% of the Party (there are rather fewer "true believers" than Frank et al think there are) would irreparably damage both parties and hand power to Labour for a generation. People *are* concerned about the junking of long-standing policy without warning during the leadership campaign or debate subsequent to it. I think that is legitimate. It is also legitimate to argue that structural changes needed to be made to the party to make it fit to fight a modern election. Why can't we all just...... get along? Im not sure where I should be pidgeonholed...moderniser or puritanical? I didnt reaise people fit into neat boxes like that. The problem I have is distinguishing Thatcherism, which in my memory was at its height from 1983-1987, the second term, from the post 1990 neo-Thatcherism, which raises certain policies to near religious icons. Thatcher was for more personal responsibility, but was yet a social conservative. She was a pro-european but had a different vision for success. She privatised state industries but was against privatising the Royal Mail. She wanted more choice in education and higher standards, but was against re-introducing state selection (11 plus/grammars). She wanted a smaller state, lower taxation, but increased NHS spending (sharing the proceeds of growth?). She was the first major politician to recognise Global Warming but continued pro-motorist spending. In other words she was a pragmatic politician, guided by principles but not an ideologue. Post 1990 the party was run, IMHO, by people who didn't share her principles or pragmatism but had accepted certain bits of Thatchers approach as core commandments - so we got the bungled privatisation of British Rail, the fuel tax escalator, spending cuts and curious pro-EU but eurosceptic approach to Europe. Norman Tebbit shares many of her principles but I'd suggest he has become a protector of the shrine of Thatcherism. He is not accepting of the changed world that has come from their success as this appears compromised - he understands DCs strategy but isn't willing to accept that much of our policy agenda is a botch of bits that survived 3 failed election bids. DC has recognised that on policies we do need a ground zero approach. Go back to principles and put together a coherent approach built on social justice, economic competence etc. And in the meantime throw off the failures by appearing radically different. I am concerned that DC on a few issues seems to have closed off solutions but in pragmatic terms those are probably ones that we cannot take to the country until we have demonstrated our competence in government. Mrs T waited till the second term to introduce her most radical changes. I am concerned though that after less than two months we are rushing to judgement - regaining public trust and getting in a position to take power isn't a few weeks work, it's a long slog. "Cameron is facing down a hostile media ..."
That's the most witless thing I've heard for months. In fact, the media is lapping up everything the wretched man says, because he's fully in tune with their own narrative, which suggests that it's only possible to win elections from the centre, cossetting the so-called public services, attacking big business, kowtowing to 'the environment' (whilst doing nothing to protect the countryside), etc, etc. And of course Lord Tebbit is right. It isn't necessary to believe that Lady Thatcher was perfect in all her actions and utterances (and she wasn't) to state the obvious: that the Conservatives have done a hell of a lot worse since she left than they did when she was in charge, and that they still seem not to have learned the lessons of that. "Which was supposed to return power to the nation states under the doctrine of subsidiarity." And laid down the foundations for the single market programme which the federalists hijacked to lead us up the path towards political union. Ted, You are right to be concerned and yes it is a long slog. People like Tebbit have had there day and should shut up. ... And laid down the foundations for the single market programme which the federalists hijacked to lead us up the path towards political union. Which misses the point that the federalists subverted the principles of the SEA. The Gillingham lecture (PDF) to the New Frontiers Foundation gives a good overview of what SEA was supposed to achieve and just what went wrong. Needless to say it achieved the opposite effects to those intended. Well, I don't know what happened there. I didn't say it was a good idea. It's hyperbole certainly, but my point was that grabbing then Communist/murderer comparison merely ignores the point being made. "James, I'm not sure it's healthy for any political participant who believes in the liberal-democratic process to compare another person (let alone another Conservative) in that same liberal-democratic process to a murderous Communist dictator,no matter how vital the internal differences between the two appear. I think it might be a good idea to keep internal Party differences in perspective..."
Oh, come on. Cameron himself recently quoted with approval a line that he believed - wrongly, because he knows very little history, but that's another story - to have come from Chairman Mao. Would he have quoted, as approvingly, a line from Hitler? Or do millions of non-Western lives, taken for no reason other than a manifestly evil ideology, not matter so much? "Which misses the point that the federalists subverted the principles of the SEA." In which case, you might as well absolve Ted Heath of any blame as well, seeing as when he signed us up to the Common Market in good faith, he could hardly have foreseen the bloated monster that the federalists would turn it into. I think Thatcherite fundamentalists like Tebbit are themselves more like Pol Pot in that they are slaves to ideological purity irrespective of the changing nature of reality. Except he didn't, Daniel. Government memoranda and civil service briefs from the time, subsequently released under the 30 Years Rule, have shown they knew exactly what they were doing. "As I said in an earlier post, it is clear to see that the party is increasingly dividing between modernizers and puritanicals." As James Maskell said, that rather crude pigeon-holing just won't wash I'm afraid. You don't have to belong to the swivel-eyed, foaming-mouthed, Heffersaurus brigade to be a critic of Cameron. As this site's Editor has quite rightly pointed out, there is more than one type of moderniser - there are your Soho modernisers, who believe that the party and the country will be saved by token gestures, rebranding exercises and pandering to the equal rights lobby, and there are your Easterhouse modernisers, many of whom you would brand puritanicals, who believe in taking real action to tackle the social ills facing our country. I'd disagree. I think they've extracted the elements of Thatcherism that have an application beyond the immediate circumstances of the 1980s. I'm sure Cameron is delighted to be attacked by Enoch Tebbit, and probably believes that the description 'New Labour Lite is a compliment (much better than being castigated as 'BNP Lite', as has been more likely in the recent past). Anyway, Tory purges are not new; didn't Thatcher and Tebbit seek to purge the memory of all those post-war wet Tory governments that had signed up to the social democratic consensus: Macmillian, Eden, Heath et al. It's simply the case that today Thatcherism, unfortunately, is a pejorative term for most people. Cameron is just being pragmatic: a Thatcherite strategy in the 21st century will lead to more opposition, not government. "One area the puritanicals should be pleased with is Europe. We look as though we have the most Eurosceptic leader in a generation." That assertion is complete codswallop. Ultimately meaningless grandstanding about who we sit next to at the trumped-up talking shop as a token gesture to attract Eurosceptic support to your leadership bid does not make you the most Eurosceptic leader in a generation. I can't see Cameron saying that he wants our money back. Is it just me or has the Conservative site just added a link to the EPP? And IDS was probably more eurosceptic than Cameron is (though arguably less use). James H: Except he didn't, Daniel. Government memoranda and civil service briefs from the time, subsequently released under the 30 Years Rule, have shown they knew exactly what they were doing. I'm keen to read more. Any chance of pointing us in the direction of the evidence for this assertion? "Except he didn't, Daniel. Government memoranda and civil service briefs from the time, subsequently released under the 30 Years Rule, have shown they knew exactly what they were doing." James, I was being facetious. But in the spirit of the argument, who's to say that in 2015, government memoranda and civil service briefs released under the 30 years rule, won't show that Thatcher's lot knew exactly what they were doing as well? And to be fair, I don't think Heath and co would really have known that Thatcher's lot would be stitched up by the duplicity and mendacity of the federalists or that Major would sell our interests down the river at Maastricht. "You don't have to belong to the swivel-eyed, foaming-mouthed, Heffersaurus brigade to be a critic of Cameron." People like Anatole Kaletsky, John Clare, Tim Hames, David Green etc. all prove that point. I don't think there's any doubt that Heath knew that EC membership involved surrendering sovereignty, despite his protestations to the opposite at the time. I don't think Heath and co would really have known that Thatcher's lot would be stitched up by the duplicity and mendacity of the federalists or that Major would sell our interests down the river at Maastricht. True, but they did know that they were surrendering sovereignty and joining a supranational quasi-state, and not the trade association it claimed to be. Although it seems the likes of Heffer and Phillips are the only ones who get mentioned, which gives rise to a false impression. I think Nigel Lawson has in the past stated that he and colleagues made it plainly clear to Maggie that the SEA would lead to greater EU interference in every aspect of our lives. Now it is fairly clear why: most legislation produced by the EU is single-market legislation, under the justification that it covers goods being traded in a single market. But as virtually anything can be traded across borders, this gives the EU the right to regulate any stage of production of any product anywhere in 25 countries. Maggie could well have known what was going on but played along: unaware of further integrationist steps that would be taken, or assuming that future UK governments would not take further steps (Maastricht, Nice, constitution), she could have decided to put up with the negative impacts of SEA on sovereignty in order to achieve that most Conservative of goals, the single market. As for Tebbit, comparisons with Pol Pot really give the impression that he has no sense of proportion or moderation. There are better ways to make a point. "Although it seems the likes of Heffer and Phillips are the only ones who get mentioned, which gives rise to a false impression." Ted Heath knew what he was signing up to when he took this country into what is now the EU. Mrs Thatcher knew what she was doing when she signed the Single European Act, even if now she says she was tricked. John Major knew what he was signing up to with Maastricht and Blair knew exactly what he was signing when he signed up to Nice. Let us not kid ourselves in to believing that they didn't really know what they were signing up to. You only have to read these dreaded documents to know exactly what they are about. Mrs Thatcher was a truly brilliant leader of our Party and a wonderful Prime Minister, but she did sign us up to the Single European Act. As for David Cameron being a Eurosceptic where is the evidence? Roger Helmer has still not been welcomed back into the Conservative fold and we are still members of the federalist EPP-ED. I thought Walden had retired. In any case, he does have a good point in that Mrs Thatcher wasn't a Tory, but then I think there's a distinction between "Tory", "conservative" and "Conservative". The latter is the one that contains room for any form of ideology. Remind me who was PM when we joined the ERM? Are in my view not terribly useful. "Remind me who was PM when we joined the ERM?" Thatcher was initially opposed but allowed Lawson to talk her into it. I am interested to know the reasons behind criticism of Heffer and Phillips. They seem to believe in lower taxation, restoration of grammar schools, limiting immigration, tougher law and order policies and resistence to European integration. In short they believe in the sort of Conservative values that I expect most people who post here believe in. So why do they attract so much criticism? I accept that Heffer can come across as pompous but Phillips has always struck me as knowing what she's talking about. Can tebbit just go into a cave and hide please? As per usual the "Thatcher wasn't a true Tory" brigade have conveniently forgotten about former Tory PM Lord Salisbury who supported "Thatcherism" (a small state and free markets) 100 years before she did. So not being in the EPP makes him anti europe, I think some people on this site are living in a dream world when talking about Cameron but then they were probably the same people again who didn't even bother to go to the last selection process on EU candidates? Shame Stephen Harper don't do better in Canada as while he won more seats in the big two areas his party got stuck in terms of seats in the other 11. That's because they overlook the point that Conservatism involves both the 19th century liberal and Tory traditions. The inconvenient answer to my last post was that one Margaret Hilda Thatcher was PM when we entered the ERM. Just as she was when we signed up to the single market, with all the loss of sovereignty that that entailed. And the point there, Gareth? The point is that Thatcher's record was not nearly as ideologically 'pure' nor as objectively successful, as Tebbit & Co. would have us believe. This Thatcher-myth has been a problem for us since 1990, because it means that anything her successors do or say is compared to a non-existent Thatcher Utopia. Thw whole dichotomy therefore between Thatcherite past and Cameroonian present is flawed. The point is that Thatcher's record was not nearly as ideologically 'pure' nor as objectively successful, as Tebbit & Co. would have us believe. And that's a great big straw man, if I've ever seen one. Tebbit doesn't claim that Thatcher's record was ideologically pure or an unmitigated success. In "Margaret Thatcher's Revolution" Tebbit is quite open about the failures there were, especially after '87. Thw whole dichotomy therefore between Thatcherite past and Cameroonian present is flawed. The dichotomy that being made is not between pursuing a Thatcherite agenda and not pursuing one, but rather that Thatcher pursued an agenda that also addresssed the concerns of her supporters, while Cameron seems willing to talk about anything but that! I suppose the key point is that moral courage is needed in defending unfashionable opinions as Keith Joseph and Margaret Thatcher did in the 1970's and 80's. Vested interests and the forces of inertia were no less powerful then in trying to defend the status quo of tax and spend, nationalisation and state control and prices and incomes policies. Yet by reasoned argument and sheer guts, never yielding an inch to their opponents, Thatcher and Joseph won the day and we are all beneficiaries. The most telling point in last week's question time came when John Redwood admitted that the reason for the party not supporting the return of grammar schools was not because the policy was wrong, but because of 'public perception'. Isn't it the party's duty to change people's perceptions ? "The point is that Thatcher's record was not nearly as ideologically 'pure' nor as objectively successful, as Tebbit & Co. would have us believe. This Thatcher-myth has been a problem for us since 1990, because it means that anything her successors do or say is compared to a non-existent Thatcher Utopia. Thw whole dichotomy therefore between Thatcherite past and Cameroonian present is flawed." This is unworthy. Thatcher's stay at No 10 wasn't supposed to be pure nor was it error free. It was, however, unlike Cameron, ambitious. It was clear about cutting taxes as a first priority. And the biggest regret of the minority of ministers who were loyal to her in her government was that they did not seriously reform the NHS or education. Cameron has more in common with her 1980s oppenents who were inside her own party, than he does with Thatcher. Surely the point is that we should avoid repeating Margaret Thatcher's failures, while building on her successes (foremost was turning round a failing economy). And that's what the likes of Tebbit seem to want us to do. For example, he doesn't urge us to centralise power from local governments, as Thatcher did, but rather to devolve it down to the actual users of local government services. "The inconvenient answer to my last post was that one Margaret Hilda Thatcher was PM when we entered the ERM. Just as she was when we signed up to the single market, with all the loss of sovereignty that that entailed." I answered that point briefly above. She had misgivings about the enterprise but was pursuaded by Nigel Lawson. That doesn't change the fact that she accepted his judgement, merely that she had sound instincts against. I am sure now that she regrets her decision. Incidently I think there is a lot to criticise about Thatcher from the Right. Failing to set our schools free, failure to deal with the NHS, failure to restore the death penalty. The point though is that she was constrained by what she could do by public opinion and (in the case of the death penalty) her own party. Only on issues that the public weren't too concerned about (such as privatisation of the utilities) could she ignore public opinion. "I answered that point briefly above. She had misgivings about the enterprise but was pursuaded by Nigel Lawson"
No. She successfully resisted Lawson and Howe. She was finally persuaded to enter by Hurd and Major. I have often wondered what made her so uncharacteristically and disastrously change her mind. I have often wondered what made her so uncharacteristically and disastrously change her mind. I understand that Major both threatened to resign and used the one other argument that would win Thatcher's support - control of inflation. Tebbit's intervention is vital. If he hadn't lumbered in, on cue, to denounce Cameron as a sell out we'd have had to go and heave him out of bed and push the script into his hand. Until the liberal propagandists and ideological policement of the BBC hear Tebbit roar they won't quite believe that their ideological hegemony will be safe under a Tory government. The $64,000 question is: will it be safe in reality? And the answer is I don't know and nor do you. But one thing i do know - it's entirely safe, 100% safe, copper-fastened safe under anything OTHER than a Conservative government. So for those who hate and loathe the liberal establishment and their BBC attack dogs I say this: better a 1% chance with Cameron (and Gove and Fox and Osborne and Davis and Maude and Montgomerie and Goldsmith et al) than zero hope with Brown, Campbell etc. "better a 1% chance with Cameron"
Better not to waste time on pointless enterprises. Loads of people worked hard to get the Tories in in 92. It wasn't worth the effort. Yeah - and loads of people worked hard in 97, 01 and 05. At various points we advocated some robust right-wing policies but the BBC and its agents trashed us and called us racists. Enough nice but weak minded middle class people bought the spin and look what happened. The only way back for the Conservative Party is to get the BBC off our backs long enough to get into power. The rest will be up to us and I suggest that the former Head of Corporate Communications at Carlton TV (a leading independent competitor of the BBC) be placed in charge of deciding what to do with the licence fee upon which the massed ranks of leftists rely for their salaries. True, they did, but part of the problem was Michael Howard and the "it's not racist to" campaign. Put the word "racist" into people's minds, and even if what you're saying is not racist, the thought has been put there. The BBC's ploy was to ask Tory leaders question after question on asylum and immigration and then ask 'Why do you always go on about asylum and immigration ?' They all seemed to fall for it. "Let's go back to the main discussion: Lord Tebbitt. Is it time, I wonder, to withdraw the HoL Whip from him? I'd certainly give him a warning..."
What? Throw somebody out of the party for daring to speak out of line? I'd have thought you'd be the last person calling for that, Justin. What is your problem with me? Comparing our leader to Pole Pot isn't just speaking out of line, it's a serious (and very public) smear. I think if the paragraph quoted above is grounds to have someone expelled from the party then that only serves to validate the comparison made. You both miss the point. Regardless of what NT did or did not do in his time, what does he do now to promote the Conservative Party, especially in the media? I did NOT say that he should have the Whip withdrawn, it was only a suggestion to encourage debate. I do, however, think he should appear before the Cheif Whip in the HoLs for a 'dressing down'. "What is your problem with me? Comparing our leader to Pole Pot isn't just speaking out of line, it's a serious (and very public) smear." I don't have a problem with you. I just find it a tad hypocritical for somebody who was suspended from the party for some rather questionable views on the elderly and the unemployed to be 'suggesting' that Norman Tebbit, who has done more for the Conservatives than you ever will, should have the whip withdrawn. And let's not forget the racist undertones of your letter to the Haringey Independent - "any 'globetrotter' need only take a walk along West Green Road in Tottenham to be reminded of the more unpleasant sights and smells of the third world... the stench from the many dirty-looking halal meat shops..." before we start squawking about people speaking out of line. Though if you've walked along West Green Road (as I have many times) it's only fair to say it is remarkably unpleasant. Racist undertones? Give me your details and I'll take you to court! As for the elderly (bed-blocking) and the unemployed, I was 14 at the time - some 11 years ago. One is allowed to make youthful indiscretions - the same cannot be said for an 80 y-o parliamentarian. "The only way back for the Conservative Party is to get the BBC off our backs long enough to get into power." Like we did in 1979 then. Yeah right. Let's not waste our time with governments than aren't worth getting elected. On the plus side, we have to acknowledge that the Bank of England has maintained admirable monetary stability, and that spending on public services has markedly increased. What Cameron is saying here is that, on the "plus side" the State has taken more money from its citizens and spent it as the State saw fit. If that's a good thing, then clearly Cameron's Conservatism isn't mine. "Racist undertones? Give me your details and I'll take you to court!" What for? I didn't call you a racist. I apologise if I inadvertently created that impression. Shall we put this behind us and move on like adults? The very definition of a hiding to nothing. It all comes down to his famous formula "sharing the proceeds of growth between tax cuts and increased public spending". It's a completely incoherent concept, as anyone realize who thinks about it for a while. It is based on the Socialist Presumption that there is a Cake To Be Divided. The problem being, of course, that the Economy is not some kind of machine "producing" a Cake (wealth) than, once it's been created, must be "divided" somehow. No--the economy is a DYNAMIC thing, wealth is created and destroyed and consumed and redistributed (i.e. forcefully taken from its producers by the State to give to those who didn't produce it). This, I would have thought, is the central insight of classical economics, from Adam Smith to Hayek. Cameron's whole philosophy is based on this profound fallacy and is therefore so muddled, so incoherent, so meaningless. The very basis of thought is based on Socialist Dogma, and therefore leads him astray. But the media and the public are economically illiterate enough so that it might take a very long time for people to realize this. In the end thought, when Brown will ask for the NUMBERS to back up the waffle words, Cameron will come crashing down. Inevitably, he is either going to promise the SAME spending as Labour (hence no tax cuts hence no difference) or he is going to promise LOWER spending plus some tax cuts. Brown will then attack him mercilessly for "cutting" services and we will be back to square one. Instead of his inane formula, Cameron should start attacking Labour's waste, its regulation, bureaucracy etc. This is the way forward. You need to say: yes, we are going to spend less but we will do more with the money, and with the tax cuts we will create more wealth. That is the conservative truth, the way and the life. It's because he doesn't have a clue. Just nice slogans. Sorry...'Dave', back to the drawing board, mate. That's more typical than notable. "You need to say: yes, we are going to spend less but we will do more with the money, and with the tax cuts we will create more wealth. That is the conservative truth, the way and the life." And the voter will reply 'liar'. Sorry, but that's the real truth. "And the voter will reply 'liar'. Sorry, but that's the real truth." That's why we need to explain clearly what the problems in the public services are: and its the government. No government minister can come along and fix it with new initiatives, the best he can do is set it free. We should constantly compare the NHS with other health services around the world, and how poorly that comparison reflects on the NHS. What is unique about the NHS that would explain its poor performance? Is it underinvestment? No. We tried that, it hasn't worked. So it must be something else. It's government control. The reason the NHS is worse than other health services is because *politicians run it*. We need to emphasise this; it's a complete sea-change in philosophy needed, not more cash. And before you say that people won't believe it, how do you know? We've never offered this before. And we have never put these arguments to the public before. We have always argued that we can manage the NHS better; but we were lying, because we can't. Our acceptance of the Labour mantra that the NHS is a wonderful institution that must be cherised and kept (or everyone will die), has reinforced our weak position. We should never have accepted those lies in the first place, doing so has left us in a cul-de-sac. We must be brave to break out of it. Goldie: I do think you've missed the point. After your selective quote, Cameron goes on to say "It would be genuinely difficult to identify other respects in which the positive elements of the 1997 prospectus have been fulfilled. Despite its 1997 prospectus, the Government has failed to maintain the competitiveness of our economy, and has failed to lift the excluded out of the trap of multiple deprivation in which they find themselves. We have seen neither economic efficiency, nor social justice. Britain has dropped from fourth to thirteenth in the international competitiveness league. Our productivity growth has halved from 2.6 per cent a year to 1.3 per cent a year - and has recently fallen as low as 0.5 per cent a year. And he goes on to criticise the "unprecedented growth in the size of the administration - both in the civil service and in the public sector more widely". So he is explicitly recognising the need to shrink the role of the state and to increase economic competitiveness. And your complaint about a lack of detail misses the point that the practice of filling every speech with detailed (but short term and centrist) announcements is a New Labour strategy that is one of the main causes of the excessive growth in the state that Cameron is challenging. The detail can wait until after the policy reviews have reported - so that any announcements can focus on worthwhile, long-term changes. I do, however, think he should appear before the Cheif Whip in the HoLs for a 'dressing down'. What despicable act could the Lord Cope of Berkeley possibly have committed to deserve such a fate. "We should constantly compare the NHS with other health services around the world, and how poorly that comparison reflects on the NHS." In what way do you think the NHS is perfoming poorly? I've now added a thread for David Cameron's Modern Conservatism speech. "In what way do you think the NHS is perfoming poorly?" 3) Such people are among those fortunate enough not to have been failed by the NHS. There are plenty of anecdotes of people who *have* been failed by the NHS, but these are usually balanced out by those saying they had good treatment. So such anecdotes are not particularly helpful. So the best way of judging whether the NHS is a success or a failure is through statistical comparisons, and here the NHS performs extremely badly -- indeed, it suggests we have the single worst health system in the advanced world. Providing specific statistics would take me a long time, and if you really wanted me to, I could provide some. But it isn't really the point of my posting. What I am saying is that this is what we should be articulating: that the problems with the NHS lie in the system itself and more than a change in management or extra investment is required. If you are seriously suggesting Cameron should privatise the NHS we may as well pick up our ball and go home. Over in the USA parents are having to pay $25000 for their childrens dental treatment because insurance companies place annual caps. If children suffer childhood illness it is not unknown for insurance companies to place $250000 lifetime caps. If you think the British public will put up with that I'd love to know where you live. No I'm not suggesting we have a US-type system. That is a straw man. The NHS is unique. How come people don't understand this? There is no other system like it in the world (as the socialists, in gushing praise, so frequently inform us). France and Germany are not harsh social-darwinist capitalist hellholes. They are, in many ways, more left-wing than we are. But they have better healthcare than we do, and for a reason. I don't believe that it is impossible to persuade the public of the merits of a German or a French type social insurance system. People want free healthcare, they don't care who delivers it. John H: Providing specific statistics would take me a long time, and if you really wanted me to, I could provide some. I would certainly find that helpful. Alternatively you might be able to point us to another website where the comparisons have been made. My point is that I have no way of knowing whether the NHS is better or worse than the French or German systems because I have no personal experience of the latter two and have never seen any detailed comparison between them and the NHS. Thanks, I have read the full speech with some attention. The point isn't that there aren't bits in the speech that are OK. Certain there are. The point is that the overall account Cameron is offering is simply completely INCOHERENT. John, I think that the statistics disprove the assertion that the NHS is performing poorly. If you check the WHO Mortality Database for an age-group that you would expect not to die, (e.g. 50 year olds), you'll see that the UK compares very favourably to France, Germany and America. Britain is an economy in the top-10 of the world, with quality of health care somewhere in the mid-30s of the world at the level of Rumania. The US system has its flaws too, but the way to go is simply introducing a European continental system of 'mixed regime' with social insurance and multiple providers. French health care is excellent, and virtually every Western European country provided superior health care to Britain. That Cameron's Cowardly Conservatives dare not state and explain this simple fact is just testimony to their lack of simple courage. Rob G, there should be more than enough information here on the Civitas website. France has more doctors earning less money than ours. Who's going to tell the doctors to take a pay cut. No one cares who delivers the service until things go wrong. I don't think Cameron will get away with saying "nothing to do with me." I agree the NHS isn't perfect, the waiting times can be ridiculous, but if the hospitals are privatised every blunder will be headlining the BBC News. I just can't see how he'd get away with it in the near future. Goldie, as with John, you have to support this criticism of the NHS with data. Check out cancer at 50 on the mortality database... In France the male death rate for malignant neoplasms at age 45-54 is 230 per 100,000. In the UK it is 120 per 100,000. Where would you want to be treated?